On Monday hard-hatted bailiffs evicted 70 squatters from six Victorian mansion blocks on Rushcroft Road: my road. Is this really the price that must be paid for low crime rates and organic bread? Delicious but deadly? The upmarket end of Brixton market – Brixton Village. It was a Monday morning. It started not with a knock but with a battering ram: the crash of the bailiffs claiming their prizes. There were crowds of them, hard-hatted, here to evict more than 70 squatters from six Victorian mansion blocks along Rushcroft Road: my road. Some had been living in the buildings for decades – quietly, their windows shrouded with sheets. We barely knew they were there. The local authority, Lambeth Council, has plans to sell the buildings to developers for an estimated £5.5m – half of them earmarked for affordable housing – and for that, it needs them empty. But the forced evictions became a flashpoint in a community that has changed almost beyond recognition in the last five years. Locals gathered in the street, catcalling as the first of the residents were bundled through the doors. Bins were set alight, windows broken, walls spraypainted. “YUPPIES OUT,” they spelled out, one letter at a time. Then “BURN THE BAILIFFS”. It was a startling scene in an area now more commonly noted for its independent shops, the covered market, an art deco lido. There are pop-up restaurants and a Zaha Hadid-designed academy school, and it is regularly described in the property press as ‘up and coming’ or ‘on the way up’ or with other terms of bouyancy. It is a poster-child for urban regeneration, much transformed – on the surface at least – since the troubled times of the eighties, when an alienated populace rioted in the streets and the nineties, when the name “Brixton” became synonymous with drug and gun crime. Certainly it is almost unrecognisable from the Brixton of even five years ago. When I first moved here I was permanently penniless, a part-time photocopier with ink-stained hands. I found a room in the loft of a grand old house on Brixton Hill, sharing the kitchen with a friend and three invisible bachelors who kept to themselves. It was fun, lively, but best of all cheap. Nightclubs were accessed through chicken shops, evangelists thronged the streets with their loudspeakers, the church yard functioned as an all-night social club for the down and out or simply insomniac. Once a man in a HMP Brixton jumpsuit politely requested that he accompany me to the nearest cashpoint (“What?” I asked, confused. Then when I realised I was being mugged, very gently: “Oh, no, thank you.” He did not press the issue). Since then Brixton’s rise has been gathering momentum, overtaking me even as I clamber up my own career ladder. Take out shops closed, to be replaced by organic bread shops and wine merchants. Around the corner, a vegan cupcake shop. It has not been a comfortable transition. Many feel alienated in an area they have lived for decades as the community identity is drowned out by this new concept of what Brixton is and means. Inevitably, prices have risen. The average Brixton property now sells for £430,000 – up 25 per cent in a year, according to estate agents. Locals are displaced by the professionals, the monied, the university educated – pushed further from the centre or forced to work longer hours to keep their homes. Meanwhile, pawnbrokers are springing up almost as quickly as the cafes: Sell your gold! Instant cash! Loans in minutes! Lambeth Council’s housing list is now so overstretched it has suggested it could rehome homeless families 75 miles away in Margate, quite literally bussing the poorest out of the borough. Bubbling resentments such as these can build up. Pressure releases in unexpected ways. Earlier this month, a bailiff was shot and seriously injured while attempting to evict a former nightclub bouncer from his home. When Foxtons, the estate agents, opened on the high street in March, it was targetted by vandals. “YUCK,” they wrote across the plate glass facade. And “YUPPIES OUT” again, the most common refrain. It became a symbol of gentrification – the ‘Hoxton-isation’ of Brixton, as the local blogs call it – and was forced to hire in bouncers. Last night a police van was parked outside the office, just in case the anger spread from Rushcroft Road across the square and through the windows. This community which was so proudly inclusive and multicultural now feels uncomfortably stitched together. And never more so than today, as heavy set men affix metal shutters across the windows of my neighbours on both sides. Like it or not, I was one of the yuppies that moved in. Our own block was squatted until 2003 when it was sold to a private developer, my landlord. My flatmates and I are conflicted: we miss old Brixton. But didn’t we help form new Brixton, spending our money in the new shops, drinking in the pop up bars. And isn’t crime lower, isn’t the coffee better? In any case, I’m moving out. I spend the night of the evictions packing my belongings into a borrowed car, uncomfortably aware of the contrast of my shuttling up and down the stairs with my bags and books as on all sides the contents of the squats are dumped unceremoniously from the windows onto the street below. It’s late night by the time I finish. Outside it is still hot, humid – sultry as a Tennessee Williams novel – and the sky is streaked red and pink. Some would call it sunset; others, sunrise. 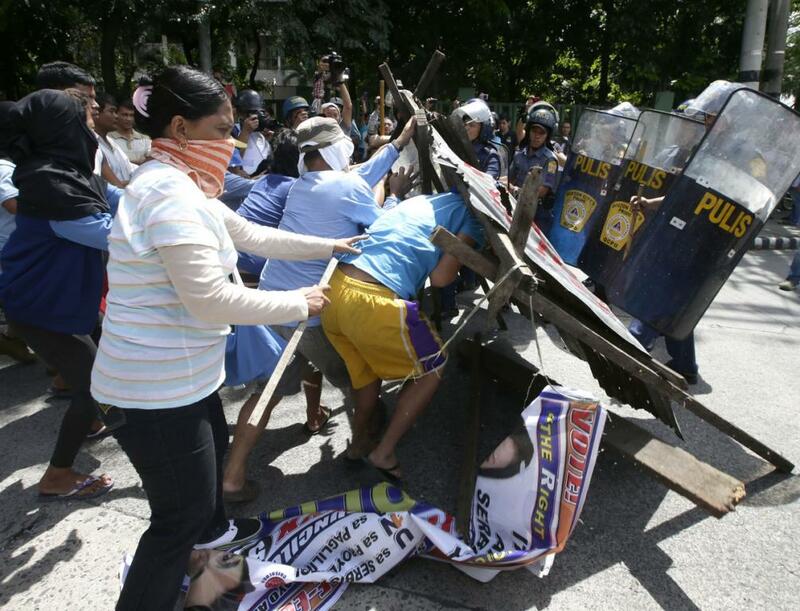 Thousands of people living in slums in Manila have fought fierce battles with police, who are trying to evict them from their homes in order to make way for a multi-billion dollar project to turn the area into a new business district. As police moved in to the 72 acre site, residents erected barricades, and fought back the police using rocks, nail bombs, and bags of faeces. The police repeatedly charged the barricades with batons and teargas, but without success. Of the 10,000 families housed in the area, 8,000 have already been relocated (violently removed) over the last two years, since the government signed a huge deal with a leading real estate company. Many of the residents are migrants who earn poverty wages, and have lived in their homes for over 30 years. The site that the government are proposing to relocate people to is many miles away from Manila, their families, and their jobs. In a typically callous statement, the minister responsible for the project claims that those refusing to vacate their homes of several decades are “Professional Squatters”, and militants who are agitating for a better relocation package, and that “they will not be tolerated, and dealt with accordingly”. From Vice. I hate Vice but the article is a good overview of what’s afoot. It’s been 23 years since the Berlin Wall was demolished, and now the bulldozers are back. This time, however, no one’s clapping. When word got out that a developer was planning to build a luxury apartment complex right on top of the preserved section of the wall (known as the East Side Gallery), 6,000 people showed up to block the demolition crews, proving that irony is still alive and well in the city that, 23 years earlier, was campaigning to have the wall destroyed. For a while, the public outcry seemed to work. Protests continued, petitions were signed, local artists spoke out in indignation, and David Hasselhoff even married the wall in protest, which, surprisingly, isn’t the weirdest thing he’s done in his professional career. It’s no secret that Berlin is changing. Nowadays, on a Sunday morning, the distant thud of the Berghain’s sound system gets drowned out by the nasal chatter of American exchange students drinking lattes in cute, authentic cafés. And the phrase “Silicon Allee” (Berliner Allee is, funnily enough, a street in Berlin) pops up more and more frequently, sitting nicely alongside “Silicon Roundabout” and “Silicon Forest” in the growing list of cities lucky enough to obtain their own version of California’s favorite tech metonym. Housing prices have risen more than 32 percent since 2007, and while the Wall Street Journal calls it a “melting pot of talent,” and that fine-art lecturer you’re sometimes forced to hang out with calls it “the place to be.” But not everyone is so excited. The anti-hipster rhetoric has become so prevalent these days that it’s even prompted pro-hipster advocacy groups to counteract some of the prejudice. (Is being anti-anti-hipster the new hipster?) Hipsters get so much of the blame because they’re what academics call “middle gentrifiers”—artistic types who flock to the cheap rent and subsequently make the area seem trendy to listings magazines who think that video-art installations in dirty squats equal cool, pushing up the rent and forcing out the established community (in this case, largely Turkish) who’ve lived there for years. It’s the same story from Dalston to Neukölln, with exactly the same signifiers: kebabs and dance music are the face of 21st-century European gentrification. A “not for sale” sign outside the Køpi 137 squat. Unlike London, however, this is a city that values its mietrecht—its tenants’ rights—and it refuses to go down without a fight. Most people see gentrification as an unstoppable force, but Berlin might be the first city that actually has a chance to effectively challenge that preconception. Two weeks before the first wall demo, 500 people gathered to protest the eviction of a family who couldn’t afford their rising rent. They left 15 cars burned and ten police injured. Similar protests have been happening almost every week for the past two months, and one this Tuesday got particularly violent. It’s difficult to pinpoint why more intense protests are kicking off now after years of increasing rent, but it’s safe to say that the backlash is getting visibly more violent. The Køpi 137 squat remains in place, despite attempts by police to evict its residents. On the frontline of the debate are the squatters. For a while, people thought they were doomed, but in a city where even senior citizens will squat their retirement home to prevent its closure, a blanket downfall of squatters seems unlikely. Cuvry Brache is a “free space” that won the right to exist despite attempts to develop the area. People camp there in tents and hold festivals in the summer. The squatters’ existence is a bit of a paradox. Those taking residence at Køpi 137 and the Cuvry Brache squat in the Kreuzberg district know that gentrification threatens their existence, but they also know that their existence encourages gentrification. The more radical squats that exist in Kreuzberg, the more appealing that Kreuzberg seems to middle-class art students and the developers that inevitably succeed them. Their solution to this vicious circle of hipster-driven gentrification is to surround themselves with graffiti saying stuff like “No tourists, no hipsters, no yuppies, no photos” and chasing you with dogs if they see you pointing a camera toward them. In fact, the only way I managed to get photos was to go when the squatters were forced indoors by a foot of snow. A teepee home at Cuvry Brache. Those who aren’t squatting are protesting against the oncoming pileup of gentrification. I went to one demonstration held by residents of subsidised housing in Kottbusser Tor, an area in central Kreuzberg. Even though their accommodation is meant to be social housing, it’s becoming increasingly unaffordable. I asked him if many of his neighbors were being evicted. “Yes,” he responded. “Five or six letters of eviction are sent out every day in Berlin. We’ve managed to prevent many of them, though. And Matthias has a point. Around half of Germany’s voters are renters, and with the federal elections coming up in September, politicians will be forced to address the issue. The Pankow district is already imposing a ban on luxury modernizations, while Peer Steinbrück, the Social Democrats’ candidate for chancellor, has proposed reviving Germany’s low-income housing program that was left behind in the 60s. The destruction of the East Side Gallery might seem like a death knell for old Berlin, but that isn’t necessarily the case. The important thing is that so many people demonstrated against it, and that more and more protests are happening every month. As the issue starts to reach its boiling point, the world should keep its eyes fixed on Berlin because it may just provide the first real solution to the gentrification that’s been sidelining heritage and bulldozing history all around the world.